Out of print for several years, we have seen this neat sticker book priced at up to $20.00! This fun book of stickers is just loaded with possibilities! 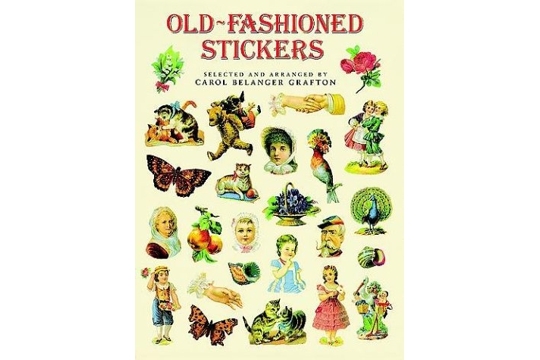 There are cats and kittens, birds, butterflies, charming children, clasping hands, flowers, seashells, exotic ladies and demure damsels, military men - even Thomas Jefferson - and these are just a few of the subjects in this fine treasury of full-color-stickers. Selected from rare turn-of-the-century (that is, the 19th to the 20th century) chromolithographs, the images recall a bygone world of simple pleasures and unabashed sentiment. Just peal and apply to bring a touch of nostalgic charm to stationery, gift packages, greeting cards, and more - almost any flat surface. There are 89 full color stickers on 8 pages, printed on one side only. The softbound book measures 8-1/4 by 11 inches.